Quiet Window Air Conditioner: What’s the Quietest Window AC of 2019? Are you looking for the best quiet air conditioner? What about the quietest window air conditioner you can buy? In this article, we’ve compiled several quiet window air conditioners that we think it will answer your questions. Whether you are sensitive to bumps in the night or sleep like a rock, the sound has the potential to affect your rest and your health. Although all manufacturers on the market claim that their products produce good background noise, otherwise known as “white noise”, is a benefit to the ability to sleep. Many of them make too much noise that can wake you (or your baby) up at night. If you’re going to buy a window air conditioner for cooling a bedroom, it makes sense to invest your money in the quietest unit available. It may cost more, but can help you sleep better all night in this summer. Let’s get started and see which one is the right for your needs. 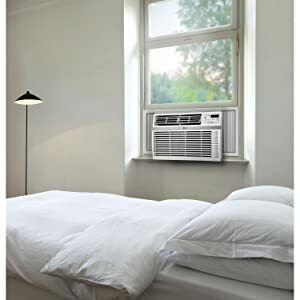 In the following comprehensive buying guide, we will explain everything you need to know before buying the best quiet window air conditioner. We will also show you the quietest window air conditioners on the market and briefly review each of them. How Loud is Your Window Air Conditioner? Before we move onto any of the more interesting stuff, we just want to make sure you understand how the noise level of an air conditioner is rated. The level of noise air conditioners make is expressed in decibels (dB) – which is a unit of measurement that indicates how loud a sound is. Humans can hear sounds between 0 and 140 decibels. 0 decibel does not mean that there is no sound, merely that we cannot hear it. 0 decibel is the so-called hearing threshold for the human ear. Hearing more than 140 dB can be too painful for our ears. To buy a quiet window air conditioner, you need to look at an AC’s decibels rating. The lower the decibel rating, the quieter the AC. Running a vacuum cleaner produces 70 to 75 dB. Running a garbage disposal produces 80 to 85 dB. Busy traffic comes it at 70 dB while a subway registers 90 dB and an airplane taking off comes in at 100 dB. As loudness increases, the amount of time you can hear the sound before damage occurs decreases. A noise level of 85 decibels within an 8-hour shift can lead to hearing loss. Those numbers above don’t really make sense. The difference between 50 dB and 60 dB is obviously 10 dB, but as far as decibels go it is around ten times louder. Also, 60 dB is 1/10 as loud as 70 dB. Most window air conditioners on the market today rated from 40 dB to 70 dB. It’s inevitable that as an AC increases in size, noise levels will increase. A 10,000 Btu window air conditioner is often louder than an 8,000 Btu window air conditioner. An AC also generates more noise when it runs on higher fan speed. The quietest window air conditioners should be less than 60 dB on the lowest fan setting. And if your window air conditioner is rated less than 50 dB, it’s extremely quiet. Although most people think that noise from air conditioners causes insomnia, it can have a positive affection on sleep as well. Sounds like white noise, for example, can moderate intermittent noise levels and provide a consistent backdrop for more peaceful rest. We need to clear up something crucial before we move onto looking at the quietest window air conditioners. After all, would you really spend money on something if it’s not capable of satisfying your needs, even if it doesn’t make a lot of noise? The best quiet window air conditioner must also be powerful enough to cool a room quickly and keep you comfortable. If an air conditioner can’t perform this function, then it does not serve its purpose. Before looking at the noise level of a window AC, the first and most important consideration is the cooling capacity. For the best efficiency and effectiveness, stick with a unit that has a BTU level designed to fit your space. A window AC with too little BTU power will run continuously to try to cool a large space and, in the process, will eat up your energy budget. A window AC that’s too large for your space won’t cool and dehumidify your space evenly, leaving your room air susceptible to uncomfortable hot and cold pockets. Window air conditioners typically have cooling capacities ranging from 5,000 to 12,500 Btu. For a small bedroom or home office (100 to 300 square feet), look for an air conditioner with a capacity of 5,000 to 6,000 Btu. To cool a bigger or busier room (250 to 400 square feet), you’ll want to step up to a mid-sized air conditioner rated at 7,000 to 8,500 Btu/hr. For a large room such as living room or family room (350 to 650 square feet), you’ll want a large air conditioner, 10,000 to 12,000 Btu/hr. Because the average household spends 15 percent of its annual utility bill on cooling, so it’s important to choose energy-efficient models. Look for a unit with an Energy Star label and an Energy Efficiency Ratio (EER) of 10 or above. An Energy Star qualified air conditioner use 15 to 20 percent less energy than units without that certification. And the higher the EER, the lower your operating costs. The best quiet window air conditioners have an EER of 10 or above. Now, you’re ready to beat the heat with some of the quietest window air conditioner options available to you. We have detail reviews and honest rating on window air conditioners from the unbiased experts you can trust. 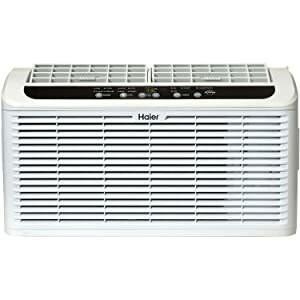 The Haier ESAQ406P Serenity Series is the quietest window air conditioner you can buy. It is the 6,050 Btu unit with re-engineered internal mechanisms that deliver powerful cool air while producing a gentle hum equivalent to a rain shower. Unlike its clanging competitors, whose decibel levels approach the roar of freeway traffic, this hushed window unit produces only 43 dB because it incorporates a buffer around the compressor that muffles sound and absorbs vibration, making it 10 decibels quieter than the average window AC in its category. This unit is designed for cooling a room from 150 to 250 square feet. It also can remove 1.5 pints of moisture per hour, which will make it feel cooler, faster. An Energy Star certification is the sign of an energy-efficient window AC. So this unit is 15 to 20 percent more efficient than what is required by law. It also has an impressive 11.2 EER, which means it is designed to use every watt effectively. This quiet window air conditioner has a range of operating modes such as automatic mode, sleep mode, energy-saver mode and 24 hours on/off timer, makes it easy to get the exact environment you want. You never have to get up to change settings; they all will be accessible from the LCD remote control. If you’re looking for a quiet window AC to use in your small bedroom, this unit is the best option available. Keeping you comfortable on those long summer without waking you up. We actually rated this product that is totally better than the Haier ESAQ406P Serenity Series, but it’s too pricey for our first spot. However, if there’s extra room in the budget, or you’re shopping for the bedroom, this unit just may be what you’re looking for. 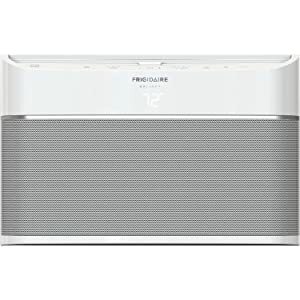 The Friedrich 5,800 BTU Kuhl Series is the quietest window air conditioner available with an operation as low as 43dB. This unit has been designed for a quiet. It comes with extra thick rubber grommets absorb vibration and reduce noise, while steel inner walls and extra dense insulation block outdoor noise from entering the room. This unit also has 8 ways air flow systems that offer precise air distribution, which will make it feel cooler and faster. And it’s one of the most efficient window air conditioners on the market with Energy Star certification and an excellent EER at 12.2. One of the best features of this window AC is it can be controlled via an App from your smartphones, computers or tablets. The app shows your current settings, current ambient temperature, and even lets you turn the A/C on before you get home. Kühl includes two built-in energy management schedules additionally, create up to 5 custom programs to fit your lifestyle. And it uses multiple sensors to more accurately monitor indoor and outdoor temperatures so that it can maintain your ideal settings. Its sleek and modern design is another highlight of this cooling unit. It’s made by high-end materials like heavy-gauge galvanized steel, rifled copper tubing, and high-tech aluminum fins. It also uses the most durable components to extend the life of your air conditioner, including fully enclosed fan motors that seal out dirt, and powerful, energy-efficient compressors. If you’re looking for a small window air conditioner, the Friedrich 5,800 BTU Kuhl Series isn’t an option. It is large when compared to others in our AC reviews. And it also weighs 72 pounds, making it the heaviest unit we reviewed, which can complicate installation. Overall, this unit is the best, quietest, toughest and most energy-efficient window air conditioner we’ve ever seen. If there’s extra room in the budget, or you’re shopping for the bedroom, this unit is the best choice. The Frigidaire FFRE0533S1 is one of the quietest 5,000 Btu window air conditioners with an operation as low as 50dB on the lowest fan setting. As the name suggests, this unit is relatively small when compared to many other similar window ACs. It also has a lot of energy-saving options will mean a comfortably cool room without enormous energy bills. This window AC is designed for cooling a small room that less than 150 square feet in size. This unit meets the latest Energy Star standard and has an impressive 12.2 energy efficiency ratio (EER). The comfort control 4-way air direction allows you to direct the air where you want it, while the washable mesh filter reduces bacteria, room odors and airborne particles for a cool, comfortable environment. 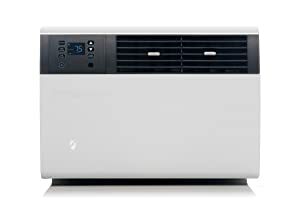 The Danby DAC060EUB5GDB is one of the best 6,000 Btu air conditioners you can buy. This unit has a good combination of features that will work well for a small or medium-sized room (up to 250 square feet) in your home and these features also contribute to a very low noise rating of 51.9 dB. The energy efficiency ratio (EER) of 12.1 is higher than many other products we’ve reviewed, so this unit could easily save you some money on power bills over time, especially if you are replacing an older unit. This unit has all of the operation modes you could want to help you stay cool in a number of different scenarios. With energy-saver mode, once your set temperature is reached, the compressor turns off and only the fan runs until the room temperature rises above your set temperature, reducing energy usage. For quiet and energy-efficient operation, turn on this mode while you sleep. The temperature will raise a few degrees and be maintained for 6 hours using a low fan speed, which ensures your AC doesn’t “over-cool” at night. 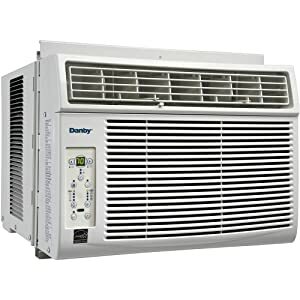 The Danby DAC060EUB5GDB isn’t the quietest window air conditioner in this list, but if saving money on your utilities and conserving energy are your main goals, it is a good option to consider. 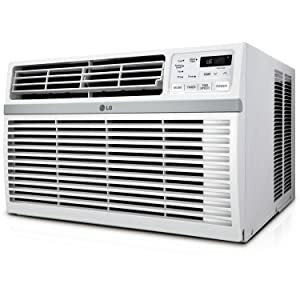 The LG LW8016ER is the best 8,000 Btu window air conditioner for mid-sized rooms that money can buy. LG’s humble 8,000 BTU air conditioner may not look like much, but this workhorse checks off all the right boxes. That’s probably why it gets such great reviews from both owners and fellow professional reviewers. At just 53 dB on the lowest fan speed, and 60 dB on the highest fan speed, the LG is quieter than other air conditioners of the same BTU rating. This Energy Star qualified window air conditioner will save you approximately 15 percent of annual utility bill on cooling. And this unit is one of the most energy-efficient air conditioners available. The impressive 12.1 energy efficient rating (EER) is high compared to other air conditioners. This unit is perfect for cooling a room up to 340 square feet. It also can remove 2.2 pints of moisture per hour. This unit can move 220 cubic feet of air per minute that will cool a room very quickly. It has a variety of operating modes such as energy-saver mode, 24-hour on/off timer and automatic mode that will help this unit meet your needs, for energy savings and for comfort. The Frigidaire Gallery isn’t only one of the quietest window air conditioners you can buy, it’s also one of the best 10,000 Btu window AC units on the market. It has all of the important certifications, including the Energy Star label, and an excellent energy efficient ratio: 12.1. This smart window AC is designed to be sleek, stylish and occupy as little space as possible. To be honest, this is the best-looking window air conditioner we’ve ever seen. The Frigidaire app (available on Apple’s iTunes store and Google’s Play store) provides you the convenience to remotely turn the unit on or off, change temperature, plus control modes and fan speeds. You will also stay informed with up-to-date alerts, such as clean filter indicators and other key notifications. At 54 dB, the Frigidaire Gallery is slightly louder than others we looked at, but it’s quieter than other air conditioners of the same BTU rating – about as loud as a conversation at home. This unit is designed for cooling a room up to 450 square feet with 3 pints per hour dehumidification. If you’re looking for the quietest window AC with a capacity of 12,000 Btu/hour, consider the SPT WA-1211S. At just 51.2 dB on the lowest fan setting, this unit is quieter than the Danby 6,000 Btu listed above. 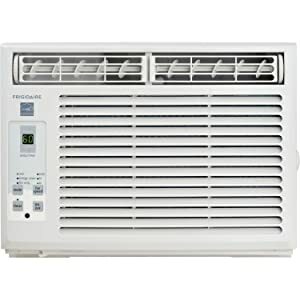 You can’t find any other 12,000 Btu window air conditioner that is quieter than this model. It’s also compact and includes numerous features and settings that combine for impressive energy efficiency. This unit is perfect for cooling down a single room or studio up to 550 square feet. Window kit supplied for left and right side of unit – ideal for vertical opening windows. User-friendly controls and remote. Easy to remove washable air filter with helpful reminder. In addition, there is a dry setting that removes excess moisture from the room, as well as auto, sleep, and energy-saving settings. This product also features an auto start, so if the power supply to the unit is interrupted, the device powers up and resumes where it left off when electricity is restored. At 52 dB, this window air conditioner is slightly louder than the SPT WA-1211S, but the estimated annual energy cost for this unit is lower. With an Energy Efficiency Rating of 12.1, the LW1216ER only costs about $89 per year to operate. Making it be one of the most energy efficient products you can buy. Like other 12,000 Btu window ACs, the LG LW1216ER is designed for cooling a room up to 550 square feet. It has an Auto Restart function, which automatically turns the unit back on after a power outage. Three powerful cooling and fan speeds allow you to control the temperature of your room at your pace. It offers 4-way air direction. By adjusting the deflection, air is directed up, down, left or right to move the air where it’s needed most. When used in Energy Saver mode the fan stops automatically when the condenser turns off and will then run every 3 minutes to determine when cooling is needed. In the end, with many great features and impressive energy-efficiency, this 12,000 Btu model is one of the best quiet window air conditioners available.